Best Seller, 50 Product Reviews, Free Shipping! Outlast Q8 Log Oil - Best Price + Free Shipping! Outlast® Q8 Log Oil is one coat oil based product that is a EPA registered wood preservative designed to protect against mold, mildew,rot and insects (termites, powder post beetles) on log homes and on wood siding. It provides maximum water repellency and sheer trans-oxide color with one coat coverage. Outlast Q8 Log Oil is a totally non-film forming EXTERIOR treatment that will never crack or peel. The solution penetrates into the wood to provide protection, not just on the surface, but also deep into the wood cell structure. What really sets Outlast® Q8 Log Oil apart is that it is more than just a stain, it is also a preservative! Looking to control that very common Carpenter Bee problem? 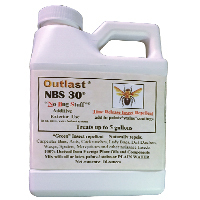 Outlast® NBS30 will deter and inhibit insects from burrowing through or crawling on surfaces. NBS 30 Additive is effective in controlling crawling and nesting activity on painted or stained surfaces to which it has been added. Ants, cockroaches, beetles, mites, spiders, fleas, ticks, silverfish, dirt daubers, bees and wasps will not crawl on, nest on or burrow through coatings treated with NBS 30 Additive. Made from all natural ingredients 100% derived from EPA exempt plant oils. One additive bottle is good for 5 gallons. Add this to your Q8 Log Oil order today by selecting it under the Additives drop down menu. Outlast® Mold-Buster contains proven fungicide, IPBCU. This fungicide prevents growth of mold, mildew, algae. This will extend the service life of coatings - less frequent cleaning needed. This product resists yellowing and will not affect the color or drying time. Use Mold-Buster when additional protection is required to control surface mold, mildew, and algae growth on the coating. It is recommended for use with coatings applied in high humidity environments and for applications where mildew has been a problem in the past. One additive bottle is good for 5 gallons. Q8 Log Oil penetrates and protects. The surface must be porous free of mill glaze, dirt, and previous coatings. Outlast Kleenstart is recommended prior to the initial application of Q8 Log Oil and subsequent applications. The better the preparation of the wood the longer the Q8 Log Oil treatment will last. Wood preservatives are toxic to wood damaging organisms like termites, powder post beetles, and fungus. Q8 Log Oil is an EPA approved wood preservative so applications of a borate treatment is not necessary prior to applying Q8 Log Oil. Wood preservatives do not protect against non wood eating insects. Ants, cockroaches, beetles, mites, spiders, fleas, ticks, silverfish, dirt daubers, bees and wasps will not crawl on, nest on or burrow through coatings treated with NBS 30 Additive. Q8 Log Oil alone stops decay, mold, and fungi. 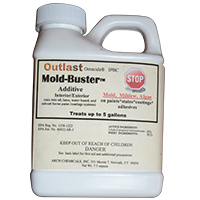 Use Outlast Mold-Buster when additional protection is required to control surface mold, mildew, and algae growth on the coating. It is recommended for use with coatings applied in high humidity environments and for applications where mildew has been a problem in the past. Outlast Q8 Log Oil can be applied during a wide range of weather conditions. Q8 Log Oil will not penetrate as well on wet or cold logs/wood. Below 50 degrees, Q8 Log Oil will become too thick to pump through a pump sprayer and may require hand brushing. Streaking of pigment may result if it rains within 36 hours of treatment. Simply re-spray the surface with more product, let it sit for 15 minutes and smooth out any streaks with a stiff paintbrush. Apply as much Q8 Log Oil as the wood will absorb. Clean tools with dish detergent and warm water or mineral spirits. As wood dries it is natural for cracking and checking to occur. It is recommended to fill any gaps larger that 1/4" with caulk. Cracks/checks less than 1/4" should be flooded with Q8 Log Oil. If applying a sealant after Q8 Log Oil wait for it to cure which is 2+ weeks prior to caulking/chinking. Curing time can vary with weather conditions. Q8 Log Oil can cure in 2 weeks with many warm and dry days. Low temperatures, humidity, and wet weather can lengthen the cure time. When time does not allow for proper curing time, the caulking/chinking should be done prior to applying Q8 Log Oil. We always recommended performing a 1 coat color test. Samples are available for color testing. Wait 24 hours after applying a Q8 Log Oil sample before observing the color. The color will lighten as the product dries. 4.9 out of 5, Based on 33 Reviews. Outlast is a Great product! Outlast is a Great product! I ordered your "Outlast Q8 Log Oil with NBS 30 additive", last the year. My log home sits where there is little to no shade and receives the maximum UV damage each summer.. In addition a had a terrible bee and ant problem as well as other nesting insects. Using your products has made this summer almost bee/insect free. I ordered more to treat my decks this summer. Great log home product! Arrived within 48-hrs. Used several products, but Q8 has, by far, been the best product I have used. I apply with a backpack sprayer and brush in tight areas. I have used this product on my cabins before...it's easy to apply, looks great and does its job! This is my first time buying from Western Log Homes Supply and my experience with them was superb...from instant chatting online, to my questions answered quickly and professionally, to follow up emails and quick service...I highly recommend this company to buy this wonderful product! The Outlast Q8 looks great on my log cabin. My ten year old cabin was looking very worn and dull. I applied 2 coats of the Q8 and now the cabin looks brand new! Like it was just built. Thanks so much. Looks great and does its job! I have used this product on my cabins before...it's easy to apply, looks great and does its job! I have ordered from here before, the Q8 log oil is awesome, and this is the best price I have found anywhere. Easy to chat online and order. Order came in two days. Great products and helped heal and seal my dried out log home. Glad to have such a quality product easily available-- our shack really soaked it in! It worked very well -- I was very pleased. Easy to mix in the insect formula, easy to apply with sprayer and the rush work, easy clean-up. Thanks! My contractor, Kyle Mickel clear coated the garage and stained the house (new construction) last summer. So far so good. He will be clear coating the house this summer. I hope to not have to do anything for many years to come. I have two foot overhangs that helps protect the siding. The sun is the culprit because I have the forest cut back to reduce moisture. I have two friends that will be stripping their log homes to restrain. I'll be recommending the Q8 log oil. FAST shipping, great prices!!! Fantastic Product! The Q8 log oil has been fantastic. Application couldn't be any easier, just spray and back brush! Two days after application we had some heavy rain and it just rolled off the wood like water on a duck!! Blended nicely where I left off and then started to finish the side a few weeks latter. Still have more staining to do this spring and definitely will be purchasing more through Log Home Supply!!! FAST shipping , great prices!!! Quality and service are of the highest standards! I was very happy with all aspects of the product. The application was very easy. Using a pump sprayer was the best application for my logs. The logs used in my home/cabin are very large. Ranging from 14"-22" in diameter. Clean up was very easy. All of the aforementioned is due, in most part, to a good "log prep". I will be using this product in the future. Quality and service are of the highest standards. I appreciate the help with the Q8 log oil. It was easily applied and clean up was a breeze. Thank you for sending the samples and I look forward to seeing how the Q8 log oil lasts. It worked very well. So far it appears to be a high quality product. We love it! Shipped Super Fast! We love it! It was recommended by our white cedar log garage kit supplier. You folks shipped it out super-fast and it was very easy to work with. The anti-bug and mildew additives have kind of a nice scent and the color lightened up nicely after a while. I especially liked the "no lap marks" and the soap-and-water cleanup. We put one coat on the new logs last fall and will follow up with the second coat this spring (still have a fresh pail). Five gallons was perfect for the 26' x 28' garage. I applied the Q8 log oil on a restoration log home this summer. The house is approximately 80-100 years old with hand hewn tamarack logs and hasn't been inhabited since the mid 1980's. We hand sanded the logs and applied the Q8 oil which seems to have revived and protected the wood with one to two coats on the south exposure. It was easy to apply with a small sprayer and seems to be working well in our Western Montana winter. We love the log oil so far. We are still in process of getting all siding on fighting thru Indiana weather. What we have done still looks really good. We are very happy with the product. I am no stranger to Q8 Log oil. I have been using it for about 6 years. I have a log home and garage and a number of woodbuildings on my property. I love the protection the oil gives all wood not only my logs. When I bought my home it had been neglected. I stripped my home using an osborn type wheel and applied Q8 about 6 years ago. Last year I gave it a light power wash and applied another coat of Q8. The wet snow and rain just bead up on my Logs. No peeling , no scraping, just apply with a garden sprayer and back brush. It doesn't get easier. Great Customer Support! Went on with Ease! We are very happy with the stain color and it went on the logs with ease. We are excited to see how long the product lasts before we need to re-stain. Customer support during the purchase was also great. Comes in no time at all! Working well and looking good for 12 years! We built our log home 12 years ago along with a log sided barn and have used the Q8 Log oil since the first application. It works well and looks great. Whenever we order it comes in no time at all. We will continue to use Q8 Log Oil. I like using the Q8 Log Oil because it lets the log breath and penetrates into the wood. This helps resist insects and protect against weather damage. It also gives the log a fresh look which makes the appearance of the cabin look new. After cleaning the logs & waiting a few days, we applied the log oil with a garden sprayer. It went on smoothly, we waited a few minutes, then back brushed. very nice looking job. Works great easy to apply didn't change color of wood! Works great!! Very simple and easy to apply. I used the CLEAR and it didn't change the color of my wood. Thanks! We used it on our lodge pole post and rail fence. Worked awesome in very humid weather. We used the Q8 Oil on our new log cabin and it worked just great for us..It made the logs appear a wonderful warm color. We highly recommend the product. We loved the Q8 oil! The color we chose was perfect and the oil is awesome. We have used it in our deck beans as well and the water just beads off of them. Will be order more soon to finish the projects. We have tried and tested many different products for the logs in our new home. There have been countless long conversations about the pros and cons of each one, and that none were satisfactory. When we discovered Q8 log oil, all that changed. This product has great consistency and balance. It can highlight the wood grain contrast and provide, and in our case, without any semi-transparency effect, just clear beautiful grain. We were able to combine the Outlast medium and dark, 4:1, to get the perfect color we desired. I love how easy it is to apply. The more over-brushing, the better it looks. Thanks for the best product we have found on the log home market! Really like the q8 log oil. Sprayed with pump sprayer and back brush. Very easy to apply and looks good! Clean up was pretty easy too. Outstanding additives for mold and insects! The Q8 log oil has been outstanding, especially with the additives for Mold and Insects. Our log home manufacturer recommends the product and we have been nothing but happy with it. The Q8 log oil is working well for me. I am using it on pine board and batten siding. I am staining the boards and battens before installing. It is very easy to apply evenly with no lap marks showing up. I am restoring a 100+ years old barn. Not sure exactly how old the barn is- it was there when my Great Grandpa bought the place in 1909.